There are some of us who love black and then there are those who dream and breathe in black. I am more of a seasonal dresser so as much as I love black I tend to shy it away from it during the warmer months. Not everyone loves color and that’s okay! When I do wear black in the summer I make it summer friendly with these simple add on accessories. Add natural elements to your accessories it can be straw, wood or esparto rope (esparto rope is what the sole of an espadrille is made of) to make a black dress summer friendly. For the most part your shoes are the key indicator to what season we’re in so adding an obvious summer shoe is a sure fire way to make your black dress summer appropriate. The open toe slide has been a favorite of mine this summer because of its effortless chic vibe. 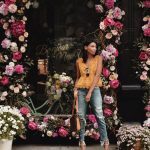 Anything floral is going to make your outfit feel Spring/Summer and of course adding color is an obvious way of making your black dress summer friendly. Choose to do one or the other or do both as I did in the photos of this post. I added the yellow floral print with my hairband and green floral print with my slides. How would you make your black dress more summer friendly? Sound off with your comments below!